The current provincial government in Ontario has cited the continuing shortage of legal pot to limit the number of stores that will sell marijuana. Fort Erie is too small to meet the cutoff for one of the initial 25 stores. The Town Council Monday night heard from citizens about putting its name on the list for when there are more stores. Some speakers favored that, saying it is good for tourism and will keep people from driving for their supply - like Anthony Claroni. "By having a retail store here that sells cannabis, it would also open us up to the tourist industry that comes across that border on a constant basis," Claroni said. "If we get people that are traveling from Niagara Falls or Buffalo or any of those places, they're all coming here, they're going to end up shopping here. They are going to end up spending more time in Fort Erie, which then allows a lot of the other businesses in the area to prosper." However, many others said making pot easy to buy is a bad idea, like social worker and family therapist Dan Silver, who said Fort erie should not want a cannabis store. "If you care about the youth, you will opt out," Silver said, "and the adults who are going to continue using marijuana or the adults who may continue to use it responsibly may have to take a 10- or 15-minute drive down the highway, but what you will be doing is you'll be saving several lives of young people who will be using it too early." Fort Erie Mayor Wayne Redekop said the latest plan is the worst of both worlds because illegal pot will flourish since the stores are far away. 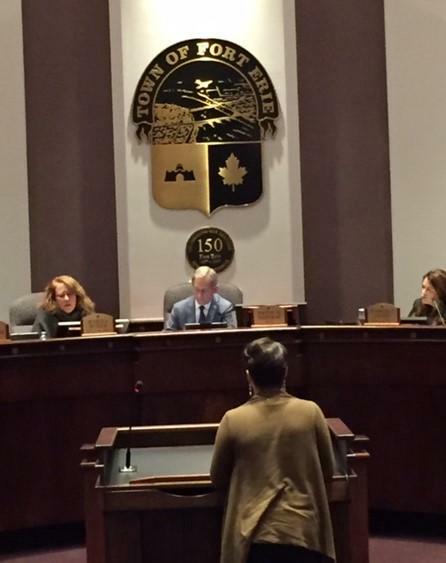 It was a full house Monday night at the Fort Erie cannabis meeting. "They're gonna still going to be growing their own and selling their own and what's even worse is the black market will continue," Redekop said. "I don't know what the government was thinking, because the whole idea of making this legal was to eliminate the black market and generate some tax revenue from a product that is easily available in our societies. So anybody that is kidding themselves about that really hasn't been keeping touch with reality." Some speakers during this discussion and an earlier three-hour session on short-term rentals like Airbnb said they are expecting Americans to come across the Niagara River, buy a lot of legal pot and rent rooms or a house and throw a completely legal marijuana party...at least until Cuomo makes it legal on the American side of the river. The Council held off on a decision.